The festival of lights is almost here and preparations are on in full swing. It’s that time of the year when you are allowed, or in fact supported, by your loved ones, to spoil yourself with all good things from clothes, to jewelry, to sweets…just about everything. So while you are basking in the festive mood, we don’t want to dampen your spirit. But being the righteous financial advisers that we are, we would like to, well, advice you! Diwali is celebrated to commemorate the victory of Lord Rama over his Arch-nemesis, Ravana. Likewise, we humans, with our limited competencies, should strive to overcome our financial evils. So here’s a list of simple things that would not just help you have a sparkling Diwali, but will also earn you a bomb of a credit score (or at least save you from ruining an existing one). 1. Give your card a break: Even as Diwali approaches, a number of special offers and schemes start flashing the market. These fancy advertisements combined with the festive fervor, beguile people into spending frantically. At such times, it requires a lot of effort to keep your credit card swipes under control and not give in to consumerism. As a rule, shop what you need rather than what is on offer, and remember to restrict your spending to at the most 50% of your credit card limit. 2. Plan your shopping in advance: Don’t wait to buy new clothes till the Diwali Diya is in your face. Begin shopping much in advance. This way, you get a lot of time in your hands to surf your options. Also, during festivals, the flight tickets touch the sky and you end up spending thrice the amount unless you are heedful enough to book your holidays months in advance. Planning saves you from spending all money at once and spread your spends across a few months. Buy big ticket items such as TV, Fridge, Laptop etc on EMIs instead on credit cards to give you some breather. 3. Stop forgetting due dates: It’s easy to forget the due dates when you have so many other distractions during Diwali. Have a calendar handy and also keep your partner or close ones informed about the same. In this way, you will be reminded of your dues and would be automatically prompted to spend mindfully. If you forget your dues frequently, it will show up in your Credit Score. 4. Protect your family’s future: Just like you would want to protect your kids from the fire crackers, you need to protect your family from the financial demons too. It is important to plan in advance so that you secure their future even when you are not around. The idea is to have a right mix of investments such as in FDs, PPF, PF, Mutual funds, SIPs, Equity or a real estate. Consult the right advisers to obtain a personalized plan for you. 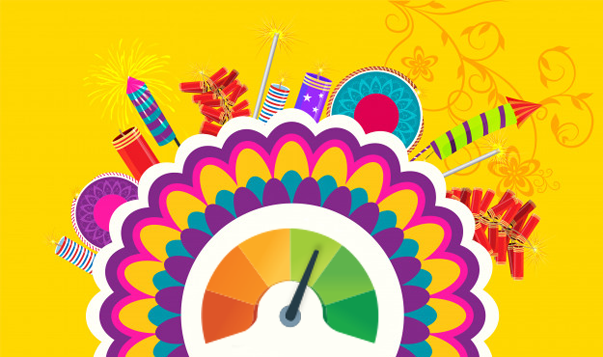 All the above pointers will ensure your family has a great Diwali while you have a crackling credit score! So here’s wishing you a very happy Diwali from CRIF India. Have a sparkling one! Previous Previous post: Planning To Buy A Car This Festive Season? Here’s a Checklist Before Signing That Car Loan!